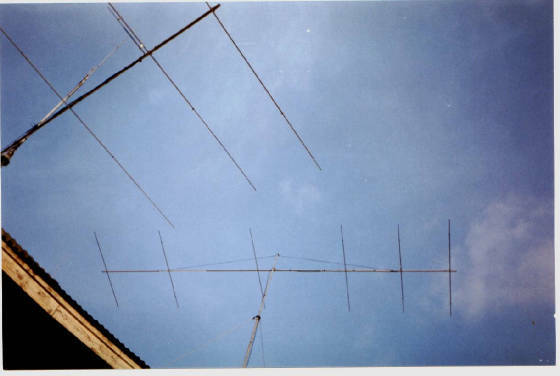 January 2001 -- Here I am on 6m (50 mhz) ,now one of my favourite bands .. I have over 100 DXCC countries confirmed ....My equipment I use is an Icom 756 running barefoot into a Homebuilt 6 ele Yagi on a 30 ft boom @50 ft - (Optimised version of the CushCraft 617-6B)...This design made a lot of contacts even as far as Japan..
May 2010 -- Trying out another optimised CC 617-6b design (7 ele on 31' boom) ,based on K1WHS optimised version .. I did a little tweaking on the PC and built it . October 2011 -- I have extended my main tower from 55ft to 70ft .. The extra guy lines are now making the 7 ele ( 31ft boom) impossible to turn a full 360 deg ....I have built and installed a YU7EF - EF606 1WL ( 6 ele = 19 ft boom ) ... I am now able to clear the guy lines and this antenna is working quite well . 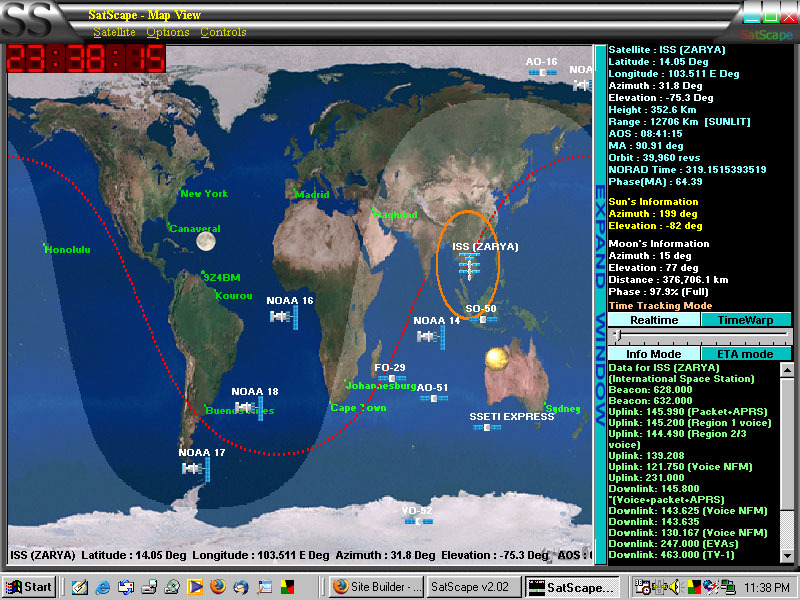 I am also active on Satellite (AO 27, AO 51, FO 29, ISS WHEN IN Crossband mode, VO 52, SO 50, AO 40 when she was active ). Satellites are fun and it really is not all that hard or expensive to get going on them...A Dual band Fm transceiver can even be used for the Fm birds. My equipment for satellite is the Yaesu FT-847 and antennas are 8 element cross polarised on uhf and a modified 5 ele cross polarised (now 8 elements)for vhf. Both antennas are made by Gulf Alpha Communications. I also have a Kenwood TR 9000 (2m All Mode).I use this rig in conjunction with an AIDC-3731 Downconverter and a homebrewed 2.4GHZ patch feed mounted onto a 3ft Direct TV dish. 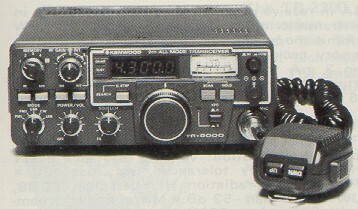 The downconverter converts the 2.4GHZ signal to Vhf, and I use the TR 9000 to receive the microwave signals from AO 40 satellite. I learnt a lot from this site and also how to build patch feeds for UHF+ bands. In order to work the Satellites, I need to know where they are. I use a Freeware program named Satscape and it is really easy and fun to use....Try it....Click on the picture to goto the Satscape website. 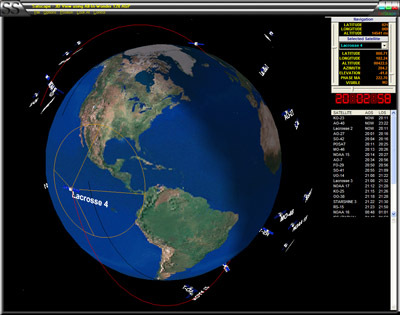 This is another Satellite tracking software called AgSattrack that I found on the net that is freeware and works pretty good...Click on the picture to goto the webpage to read and download.. 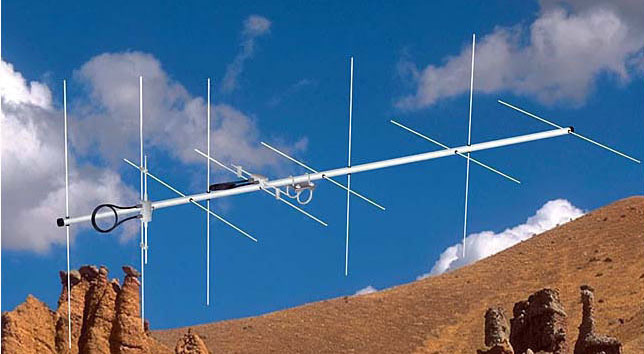 There are lots of websites showing how to build vhf and uhf antennas which can be used for satellite operation. 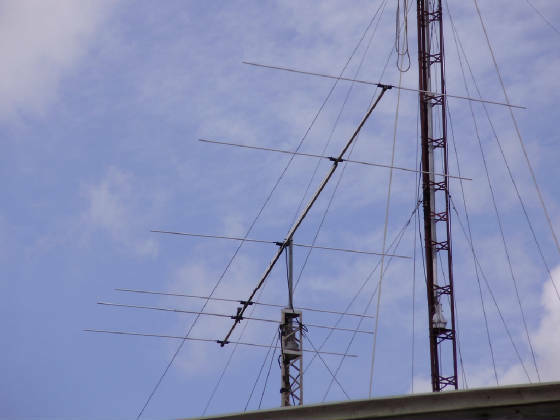 I am hoping to get active now with EME using WSJT software ...I am in the process of putting up another tower for some stack vhf antennas.. Here are some recordings I have found on the web of myself , making contacts on 6m. Here are some recordings I made of my Satellite contacts..